Click here to download our handy 4 page booklet, Publishing and Fundraising for Nonprofit Organizations. It's an Acrobat PDF file, suitable for laser or inkjet printing, or for viewing online. Now more than ever, associations and groups need to find new ways to reach their audiences and stand out in the crowded nonprofit sector. Branding is no longer just for major corporations and products ­ it's now an important element of making any organization stand out. Nonprofits are beginning to realize that branding can help them creae a unified message that reflects the unique values and purpose of the organization. That's where publishing, and Okanagan Bookworks, comes in. The majority of non-profits and charities - particularly local ones made up primarily of volunteers - overlook the potential of publishing as a branding and fundraising vehicle. When the time comes to raise money, thoughts usually turn to having a bake sale, auction or raffle. There is, of course, nothing wrong with those ways of making money. They're tried and true, and people can be counted on to contribute. However, if you want to raise money, as well as raise awareness of your efforts, publishing will take you much farther. And it doesn't have to be the complicated and daunting task you might think - with our support. A box of cookies or a chocolate bar may have your organization's name on it, but once the goodies are eaten, your message is gone. A book, on the other hand, will be seen by your audience time and time again as it's read, and often passed along to someone else. It will sit on tables in homes and offices, broadcasting your message. And it can generate newspaper articles and publicity in ways that selling candy just can't. The benefits are a high perceived value and long shelf-life. In other words, with publishing you can raise more money quicker and keep your group's message alive longer. Publishing is not limited to books and its benefits are not limited to the money directly earned. Your fundraising success is only limited by your imagination and creativity. Need Help Developing a Fundraising Communications Plan? Click Here. The Canadian Alps, an illustrated history of mountaineering in Canada was published in association with the Alpine Club of Canada to celebrate 100 years of the organization. Click here to download a detailed 4 page Acrobat PDF case study. 1. Mission. If your organization is seeking to preserve a unique piece of land, you need a visually effective book that can show what you're doing. If your mission is to fight a disease, then an informational book works best. We help you define the format and structure that suits your image and your mission. We help you evaluate your options from a standpoint of cost and effort involved, and your return on investment. 2. Message and Purpose. Whether it's volunteers, donations, or support, you need to choose the best way to deliver your message. If the purpose is to inform, a book of primarily text is the most cost-effective choice. But photographs of toxic waste will go farther in trying to activate volunteers and donors than any description will. We help you focus the project's purpose or goal. 3. Audience. Is it donors, volunteers, grant-providers, the media, or those who will benefit from your effort? Are the donors ordinary people, or major sponsors? Would a glossy and expensive publication attract them or put them off? Something aimed toward a person sitting at home can be long and reflective, whereas a piece being sent to busy professionals, the media, or business executives, needs to be short and to the point. We help you define the book that will deliver the most value, and achieve positive results. 4. Resources. The materials you have already produced for other purposes, or have ready access to, is always the best place to start the publishing process. Organizations are often unaware of what is available to them to produce compelling publications for their members, sponsors, donors, and supporters. We help you determine what you have, and what needs to be produced. There are many creative ways to gather relevant resources that do not involve cost, and we help you make the most of what you already have. How a well thought out publication can save the day. A group is looking to raise $20,000 to fund improvements to a private animal shelter. They decide to publish a desk calendar containing photos of animals from the shelter. Using $10,000 in sponsorship money from local businesses (in exchange for promotion in the calendar and a tax receipt), they produce 2000 copies of the calendar at a cost of $5 each. The calendars are sold by school kids at $12 each ­ with $10 going to the shelter, and $2 going to school funds for the kids - a great way to benefit two good causes. But wait, there's more! An anonymous donor reads about the project in the newspaper, writes a check for $2,500 to help the effort, and several people who've purchased the calendar come forth to donate their time to the shelter. Such is the potential and power of publishing, that no other fundraising effort can provide. Publications develop a solid brand platform that increases donations and volunteer interest. Publications can be tailored to your audience. Publications don't perish or spoil, and keep your message alive longer. Publications are often passed along, spreading your message beyond your immediate reach. Publications have a high perceived value, and can deliver a more detailed and thoughtful message. Publications make a strong impression, and generate publicity easily. Publications help you demonstrate your competitive benefits. Publications provide more benefits than simply the money derived from their sale. 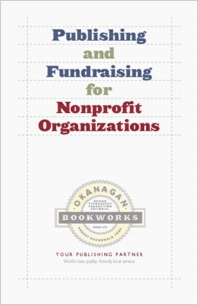 Okanagan Bookworks specializes in publications that are practical, eyecatching, and compelling. We do books, brochures, magazines, newsletters, digital publications, websites, and more. We deliver creative and cost-effective solutions. With over 25 years experience in print and digital media, our proven skills - in marketing, copywriting, text and photo editing, design, typography, and production- are at your service.